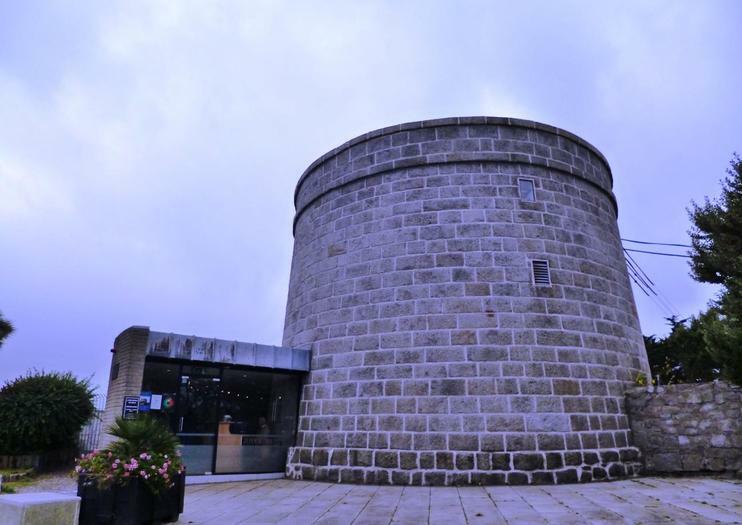 The James Joyce Tower is known for being featured at the beginning of James Joyce's Ulysses. Today it is a museum which houses letters, photographs, and other personal possessions from Joyce. The museum also contains rare editions of his work and other interesting items such as the original key to the tower, a plaster bust of Joyce made by Milton Hebald, and two plaster death masks of Joyce made by Paul Speck. Visitors can also visit the living quarters which still show signs of the tower's original purpose, defense against Napoleon. Though the tower never saw any action, the massive outer door, reinforced against attackers with sheet metal, bolts, and bars, still stands here. You can also see a trap door leading to the artillery storage room below. The only windows are narrow and angled to protect from cannon attacks. A narrow winding staircase leads to the roof where there is a circular gun deck. From the roof, you can enjoy panoramic views across the Dublin Bay. James Joyce Tower is located at Sandycove Point in Sandycove 9 miles from Dublin and can be reached train. Opening hours are 10am to 6pm daily in the summer and 10am to 4pm daily in the winter. Admission is free.